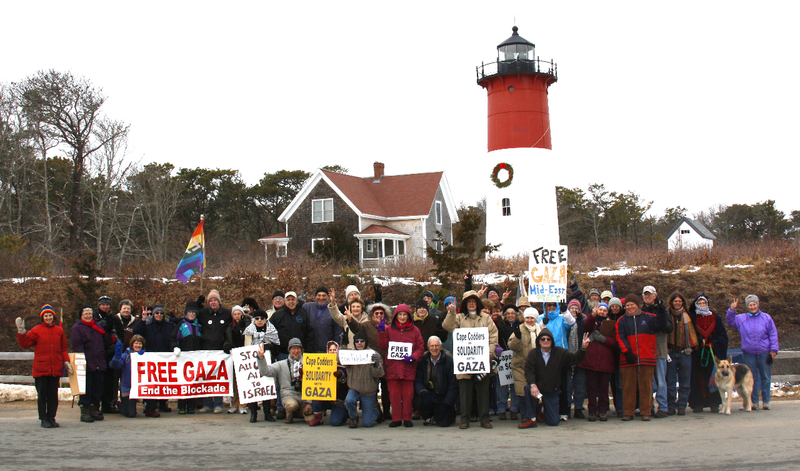 On a cold day in January, fifty people gather at the Nauset Lighthouse in Eastham, Massachusetts (see photo attached)** to march in solidarity with the 1.5 million imprisoned people of Gaza, and with the 1,400 Gaza Freedom marchers who travelled from all corners of the globe to Egypt in late December in an effort to break the blockade of Gaza and to bring desperately needed supplies to the Gazan people. Those gathered are members and friends of Cape Codders for Peace and Justice, of the Women’s International League for Peace and Freedom, of Jewish Voice for Peace, and of Progressive Democrats of America. The gathering in Eastham is surreal, of course, that people have joined together to walk on a deserted Atlantic Ocean beach in the middle of winter to express solidarity for 1.5 million people imprisoned over 5,000 miles away on the shores of the Mediterranean. The only speaker is Jeff Klein, a retired machinist and union leader from Boston and long time activist in his neighborhood organization, Dorchester People for Peace. Klein has been to the Occupied Palestinian Territories six times, including one trip to Gaza with an aid convoy. His remarks are brief. He asks the people gathered to imagine that a portion of what is known as Outer Cape Cod, from the south Eastham border to the North Truro border (for a map of the area see*** below) an area approximately equal to the 140 square miles that comprises Gaza, has been completely surrounded and blockaded by hostile and well armed neighbors. No food, medical supplies, building supplies, or people can get in. No one can get out. The people inside are being starved, primarily because they democratically elected a government their neighbors don’t like. No planes can fly in. No ships can enter or leave. Even Gazan fishermen are not allowed to take their boats out to the sea. Klein asks those gathered to imagine that this area of 140 square kilometers on Cape Cod – home to 10,000 year round residents – is populated by 1,500,000 people, the actual population of Gaza. It is nearly impossible to fathom. Then imagine, he asks, that water is rationed, that children are routinely dying for want of the most rudimentary medical care, that human waste has no way of being processed, that there is no fuel. Finally, Klein says, imagine that these same imprisoned people have been invaded and bombed by a very well equipped military, the fourth best equipped fighting force in the world, that thousands of civilians have been killed and wounded, and that the very planes, munitions, and white phosphorous being dropped on these imprisoned people are manufactured and gifted to the Israeli army by the United States of America. The situation is reminiscent of decades of United States cavalry assaults on helpless and starving Native Americans, of the Nazi imprisonment of the unarmed Jewish population of the Warsaw ghetto, of Apartheid South Africa. And the options available to American citizens opposed to the granting of billions of dollars in military aid to one of the best equipped armies in the world (while millions of people in this country literally do not have health care) are few. We can try to make our fellow citizens more aware. We can lobby and advocate with our elected officials. We can try to boycott and divest from Israel, and sanction Israel. And on a cold day in January, we can walk on the beach. * Bruce Taub is a resident of Outer Cape Cod, a member of Cape Codders for Peace and Justice, and Massachusetts Coordinator for Progressive Democrats of America. I want to thank you for your dedication to peace. All people should live in peace. The usa should stop wasting our tax dollars by giving 3 billion every year to Israel. With those dollars Israel continues an illegal occupation and practices apratheid. We let apica control our congress and it is a disgrace.